Deep venous thrombosis (DVT) is a common disorder with a significant mortality rate. Successful endovascular treatment of acute DVT is most likely to be achieved in patients with recently formed thrombus, (<10–14 days) with acute iliofemoral DVT. Endovascular treatment options include: Catheter-directed thrombolysis (CDT), pharmacomechanical catheter-directed thrombolysis (PCDT), percutaneous aspiration thrombectomy (PAT), vena cava filter protection, venous balloon dilatation and venous stent implantation. Current practice shows strong clinical tendency for the use of PCDT with or without other endovascular methods and an individualized approach for each DVT patient. PMT has not received general acceptance because of the associated risk of PE and damage to venous valves caused by thrombectomy devices. PAT is most commonly used as an adjunctive endovascular technique like balloon maceration to fragment thrombus, balloon angioplasty, stent implantation and vena cava filter placement. Interventional endovascular therapies for DVT have the potential to provide PE protection and prevention of PTS. Patient centered individualized approach for endovascular DVT treatment is recommended to optimize the ideal clinical result. Acute stroke is the leading cause of death for people above the age of 60 and the fifth leading cause in people aged 15–59. Mortality during the first 30 days of ischemic stroke is 20 % and 30 % of survivors will remain permanently disabled. Acute stroke patients within the therapeutic window must receive IVrtPA unless there is a contraindication. In case of contraindication to IVrtPA or for patients out of the therapeutic window for thrombolytics, standart of care is the intraarterial treatment. Patients have to be transferred to a comprehensive stroke center with capacity of dedicated neurovascular imaging and interventional neuroradiology. Noncontrast head CT that is used to rule out hemorrhage is followed by imaging studies dedicated to show if there is reasonable penumbra to save. 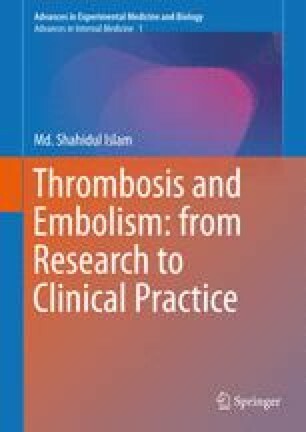 Intraarterial thrombolysis has the main advantage of extended therapy window, earlier and more efficient recanalization and less risk of hemorrhage due to lower doses of thrombolytics. Mechanical thrombectomy has several advantages over IV/IA fibrinolysis including faster recanalization and less risk of hemorrhage especially in large artery occlusions. ASA guidelines recommend choosing stent retrievers over other devices for mechanical thrombectomy. Better recanalization rates and less infarct volume after mechanical thrombectomy result in higher numbers of functionally independent patients compared with other treatments. Two landmark studies that were published recently, SWIFT PRIME and MR CLEAN, showed that IA treatment especially with the new stent retrievers lead to a significant increase in functional recovery and independence in daily life after an acute stroke. Cerebral venous and sinus thrombosis (CVST) comprises nearly 0.5–1 % of all stroke cases. CVST causes different neurological deficits depending on the sinus/cortical vein involved. CVST may cause death and dependency in 13.4 % of patients. CT/CT venography and MR/MR venography can be effectively used to diagnose and to follow up CVT cases. Anticoagulation with heparin is the most widely accepted therapy to prevent the expansion of the thrombus. Patients deteriorating despite heparinization and patients presenting with very severe neurological deficits must receive endovascular treatment. Endovascular methods include intrasinus infusion of thrombolytics or heparin, balloon angioplasty, mechanical thrombectomy or a combination of different techniques. There is a higher rate or recanalization with endovascular methods compared to other medical therapies.